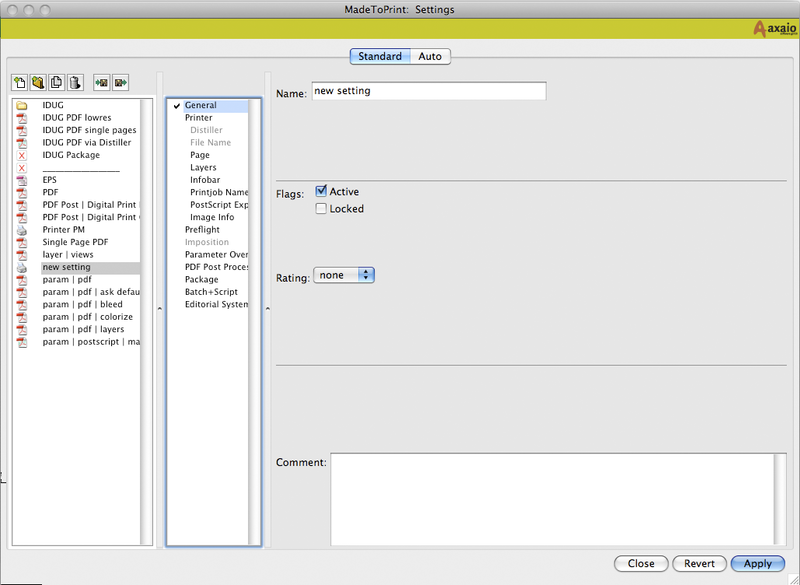 The start dialog of MadeToPrint lists up all defined jobs, which can be applied with a simple mouse click to the currently open Adobe InDesign document. 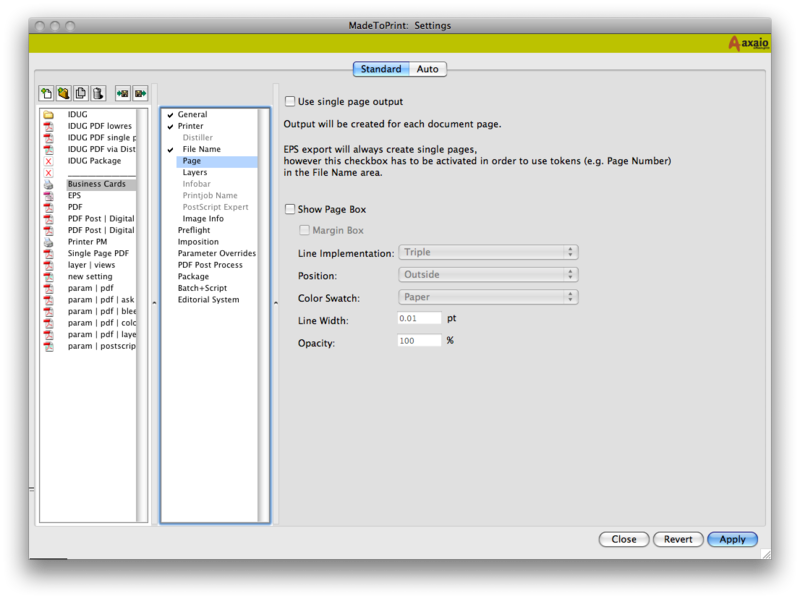 A batch processing feature enables MadeToPrint jobs to be applied to several InDesign documents in one go. 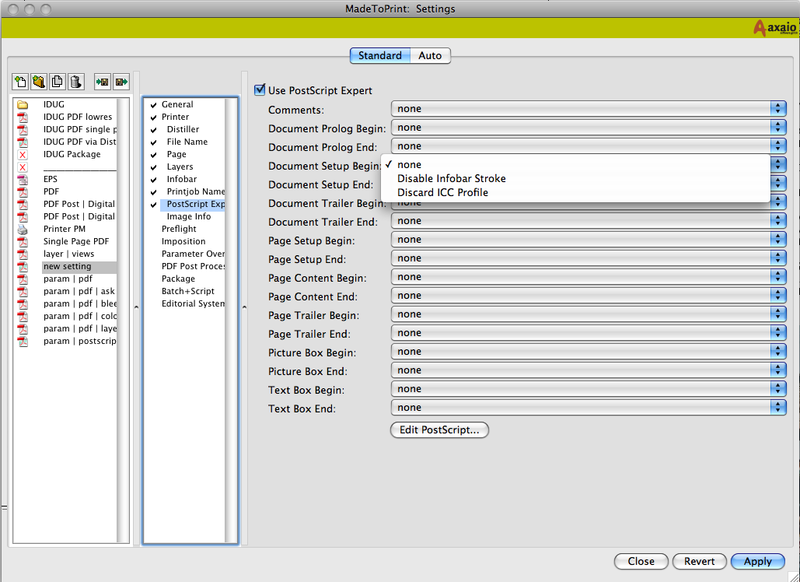 MadeToPrint can be started from the “File” menu in InDesign. Starting MadeToPrint for the first time, you will have the option to install sample MadeToPrint jobs giving you an idea about how a MadeToPrint job looks like. 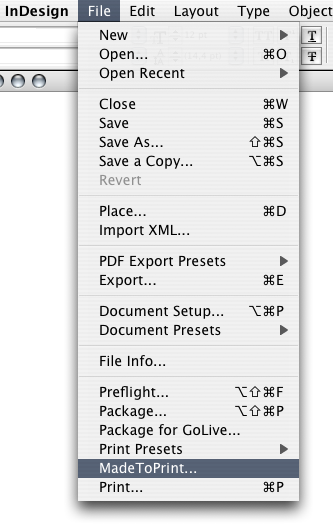 Using the Adobe InDesign option Keyboard Shortcuts… (see Edit menu) you can access MadeToPrint via Keyboard. 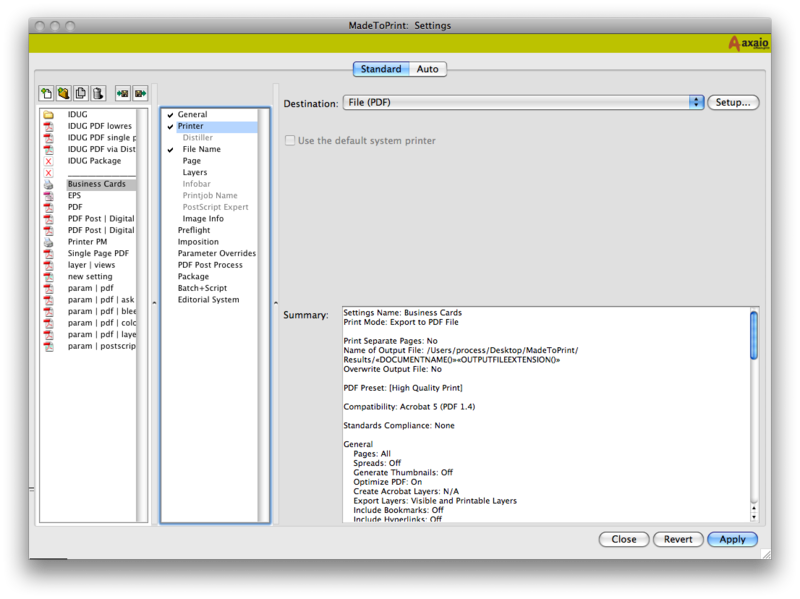 Choosing the MadeToPrint entry from the File menu will activate the run dialog. The MadeToPrint jobs or sets which have been configured can be applied to the current document by clicking on the print button. 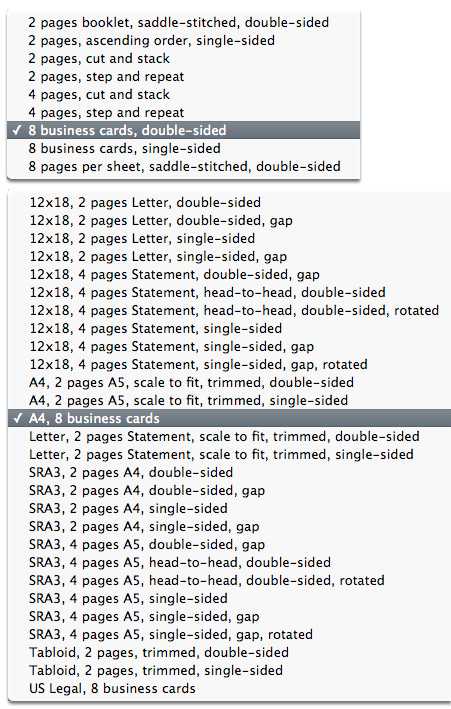 Furthermore, the number of copies can be specified for print output and page ranges can be defined. Process current document: Carries out the selected MadeToPrint job/set on the currently opened document. Process all open documents: Carries out the selected MadeToPrint job/set on all currently opened documents one after the other. Process current book (for PostScript output only): Carries out the selected MadeToPrint job/set on the currently opened book. Process all books (for PostScript output only): Carries out the selected MadeToPrint job/set on all currently opened books. 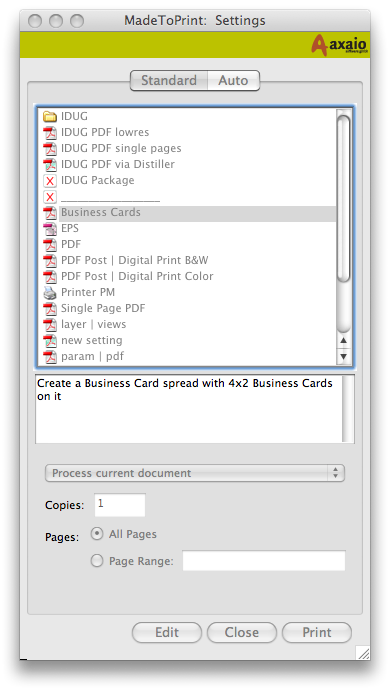 Process folder: Allows batch processing specific folders with all InDesign documents inside. To create new or edit existing MadeToPrint jobs or sets, click the Edit button. 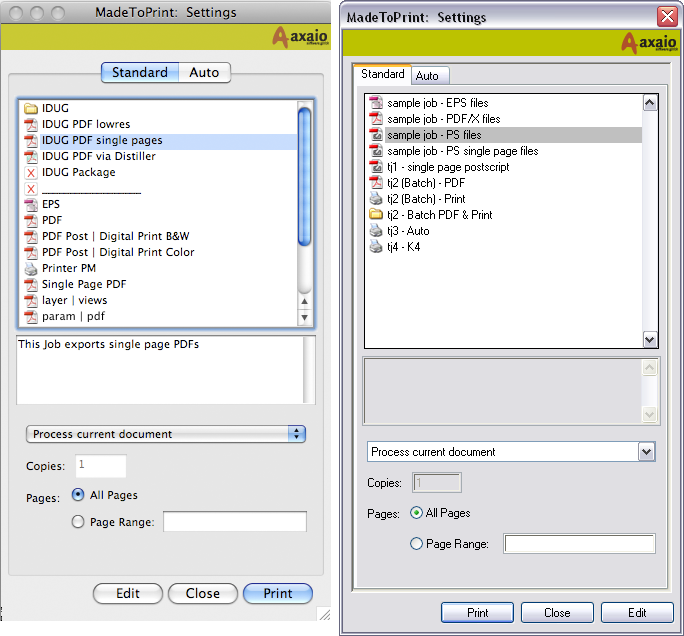 This mode provides all tools to create and edit MadeToPrint jobs as well as the option to combine several existing MadeToPrint jobs into one set in order to carry them out simultaneously. The top buttons let you Create, Duplicate and Delete MadeToPrint jobs and sets. In addition, you can import and export settings. Hence jobs can be distributed in connection with Adobe InDesign Server. The Edit box is divided into three parts. On the left you find a column listing up Settings and Sets. The middle column lists up the different groups of options. The right area displays the options available for adjusting the job. Name: For specifying a job name. Active: Untick the check box for disabling the job within run mode. Locked: Modifications to locked jobs cannot be saved. Rating: Jobs and sets can be rated. Comment: You may enter a comment to each job, which is displayed in the Run dialog, when the job is selected. We recommend you to use the comment field to note a meaningful description of each MadeToPrint job. This description will also be shown in the representation of the list in operating mode. By choosing the destination Printer, you can select an output format from a pulldown-menu. If you are using Adobe InDesign CS3/4, the output formats PostScript, EPS, PDF, JPEG and INX (InDesign exchange format) are available for use. In the case of InDesign CS4-CC, the file formats IDML (InDesign markup format), Flash (SWF and XFL) and ePub (for digital eBooks) are available additionally. The entry No Output allows to Package or Preflight InDesign documents without creating file or print output. When you click the “Setup...” button, the Adobe InDesign dialog box for setting up the print, PostScript, EPS, PDF, JPEG, INX (in CS3/4), SWF, Flash or ePub output appears. This dialog box is context-sensitive and depends on the output type previously chosen. Click the Setup… button to specify the output options (Print, PDF, EPS or PostScript). 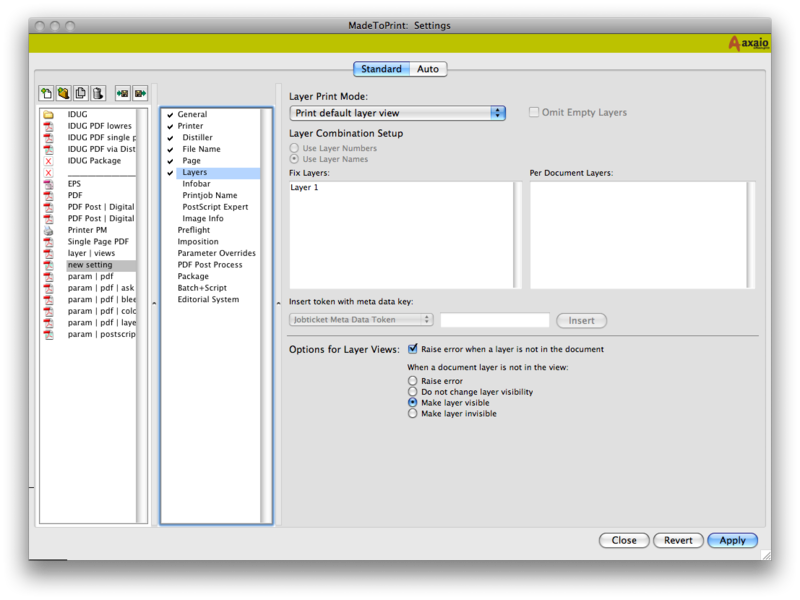 MadeToPrint addresses the print and export dialogs of Adobe InDesign for configuring the output settings. If you are carrying out a JPEG export, you can make settings for the image scale and resolution. The scale can also be set for an export to Flash CS4/5/6. In this case, you can also modify the file in line with a prescribed screen size. The page range to be exported can be restricted. Optionally, you can output spreads or rasterize pages. You can also flatten the transparency for the export. Lastly, there are settings for specifying how text is to be handled (Flash text, text as vectors, or rasterized). In addition to the options provided for the Flash export (scaling, range etc. ), the SWF export enables settings for HTML and interactivity (such as hyperlinks). There are also settings for the image quality. In this area, the creation of PDF files from PostScript using Acrobat Distiller is determined. After having defined the path to Acrobat Distiller, all Adobe PDF settings available for conversion appear in a popup menu. Furthermore, you can keep or delete the PostScript and the log files. Using Acrobat Distiller avoids problems with CID fonts in PDF files. Especially older RIPs can run into problems when trying to process CID fonts which are created when using the InDesign PDF export. In this area, users can specify destination folders and file names for file output. 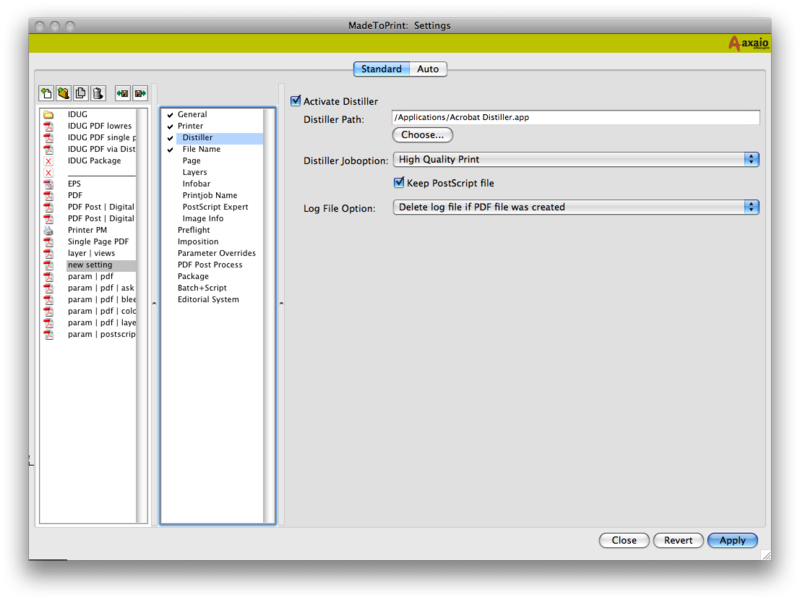 MadeToPrint supplies a very flexible tool for rule-based creation of file names and destination folders. For print output, these options are not available. File and folder names can be determined by tokens (variables). A description on how to use these variables can be found in the Token Help. 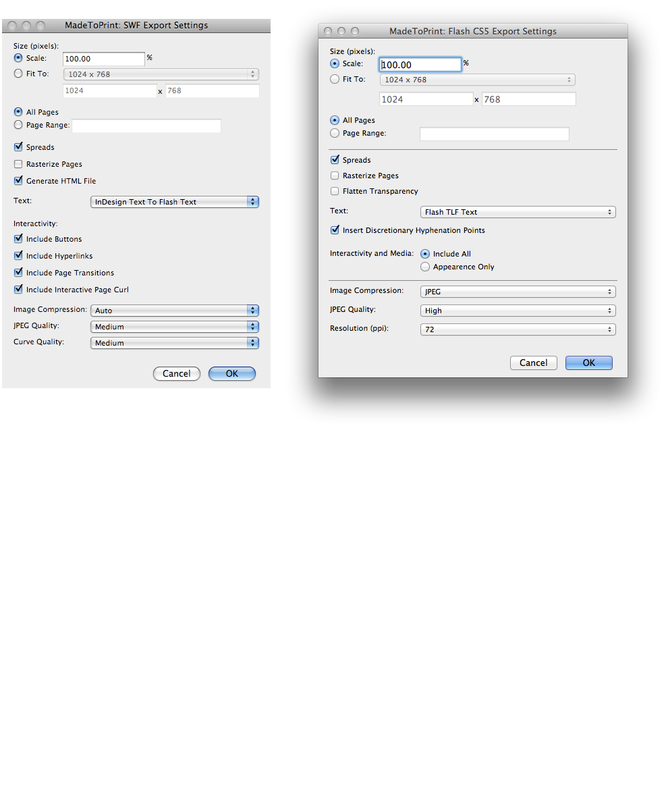 To save output files next to the current InDesign document, activate the check box Use path of current document/book. Optionally, click the Choose path button to select a destination folder. You can define a fix path or define rules that determine the destination path during job run time. To define such a rule you can choose between various tokens. A preview of the path will be displayed in case the token is used properly. To use the document name for the output file please activate the check box Use name of current document/book. A wide range of tokens is available for flexible output file naming. In connection with the single page output option, the token “DOCUMENTNAME()” can be combined with the token “PAGENUMBER()” to add the respective page number to the file name. The check box Overwrite output file defines whether the existing files are to be overwritten or to be indexed. Press the button Edit Token Sequences allows users to set up, edit and administrate even complex rules with the Token Editor. Available Token Sequences are listed up in a pulldown menu. The use of tokens is not restricted to a single entry. You can create token sequences with a combination of different tokens and also include static text. 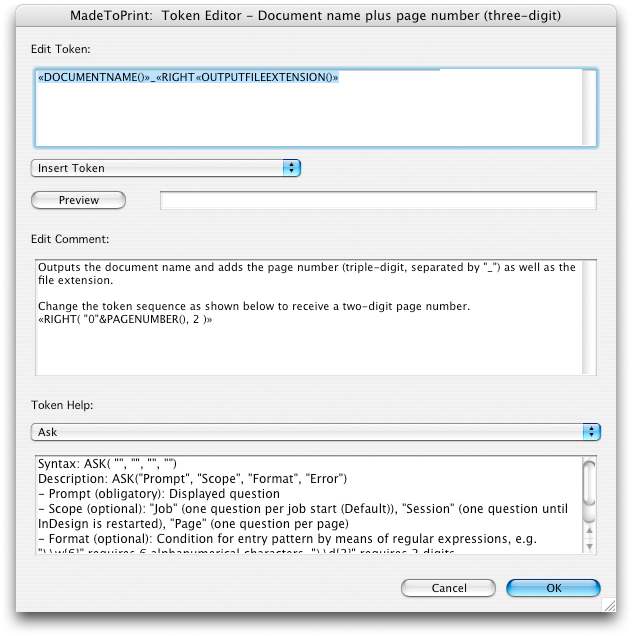 The Token Editor of MadeToPrint (Button: Edit Token Sequences) allows you to create, check and save token sequences in order to use them in different settings. In this area, you can predefine the output of documents as single pages. By using the option Show page box, users can create lines around the document or the document content, e.g. cropmarks can connected to a frame. Position, color, width and opacity of these pages boxes can be adjusted flexibly. 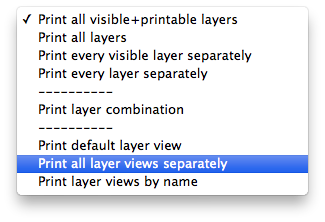 The option Print layer combination enables users to select layers and combine them to different output combinations. Certain layers can be kept, others can be discarded. Error, if a layer is not in the document. If a document layer is not in the setting, you can choose between the Error, Do not change visibility of layers, Make layer visible and Make layer invisible options. Your document contains the layers background and pictures as fix layers. 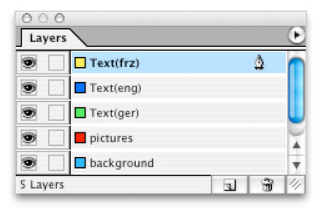 Additional layers are assigned to text in different languages (per document layer). How do I set up my MadeToPrint job? The result will be three output files each containing a different language version. The infobar can be added to printouts as well as to PS or EPS files. You can include information in three size variable fields (left, center, right), tokens are entirely supported. A preview function shows the result to be expected. To prevent the infobar from overlapping with document content, the document can be moved (to the top, the bottom, the right or the left side of the document) and scaled. The width of the three possible infobar areas can be defined using any of the following units of measurement: point, millimeter, inch or percent. 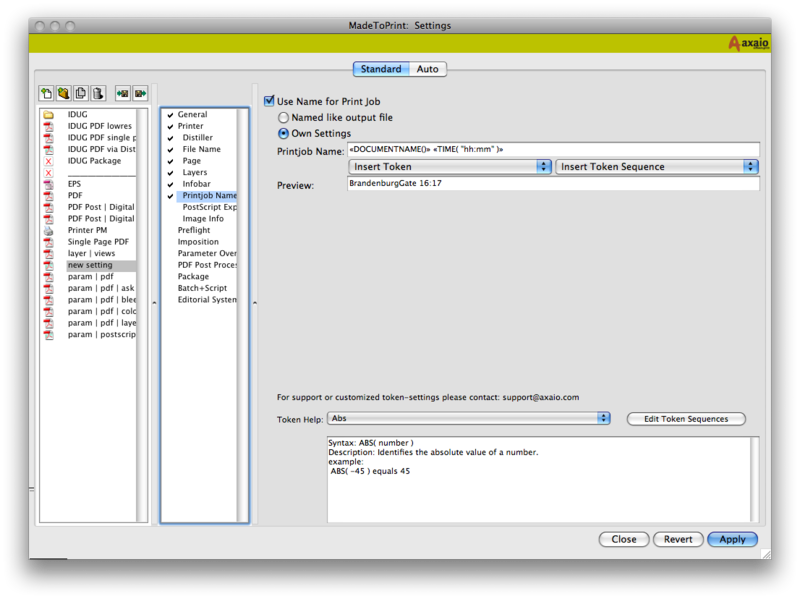 The dialog box for Printjob Name allows to setup a naming convention for internal PostScript names. By activating the checkbox Printjob Name, users can specify how the name should look like. The job name can either be the same as the output file or be determined through tokens. These can be used to evaluate information like date, time, document name, pagenumber, pagelabel etc. dynamically. A description on how to use the token (variables) can be found in the Token Help. In this area, PostScript output can be extended via PostScript snippets, to be selected from pull-down menus. As the name suggests, PostScript Expert is intended for users who are familiar with PostScript. An integrated editor allows to create, modify and save PostScript snippets. MadeToPrint offers options to preflight documents, and check for missing fonts and images. 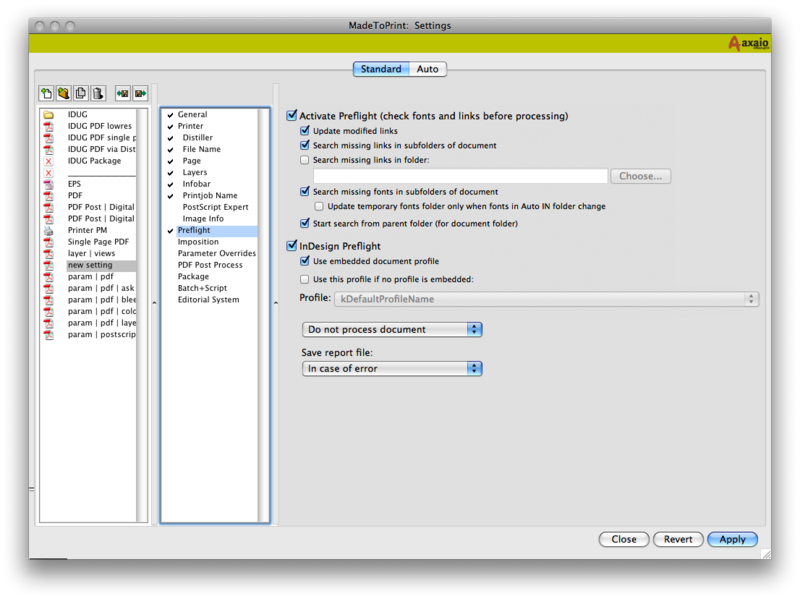 You can use the preflight functions of MadeToPrint or you can access InDesign’s Live Preflight engine. It is possible to update modified and missing links (images) and to activate project specific fonts on the fly. 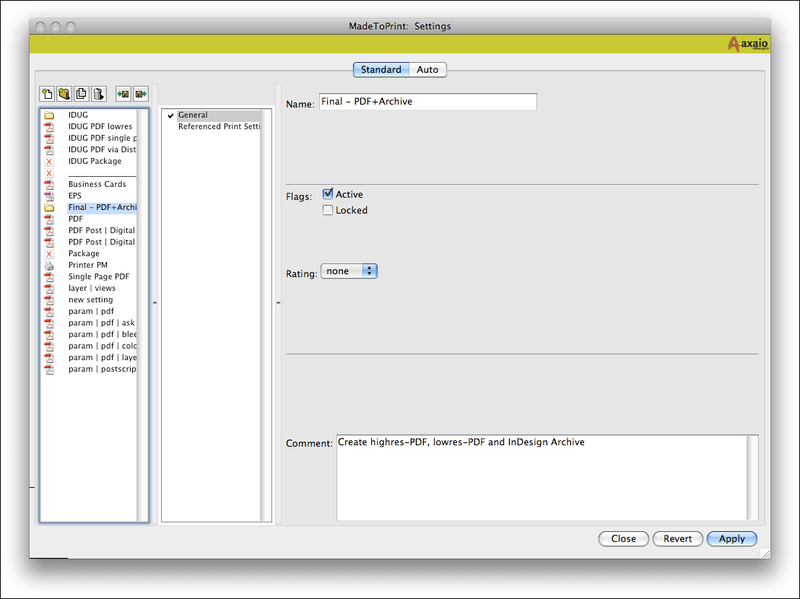 MadeToPrint searches for missing fonts and images in folders and subfolders next to the InDesign file or optionally starts searching from the parent folder. 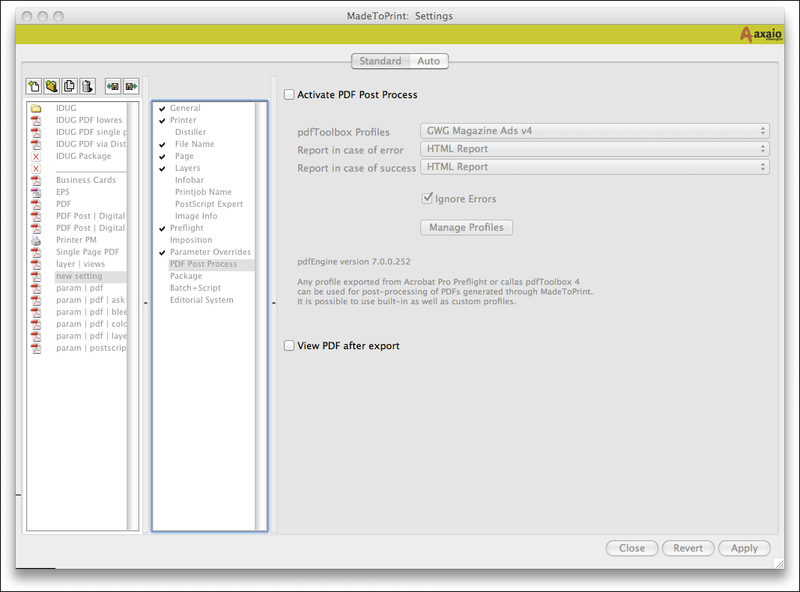 MadeToPrint places the missing fonts in the temporary Fonts folder, which is located in the Adobe InDesign application folder. 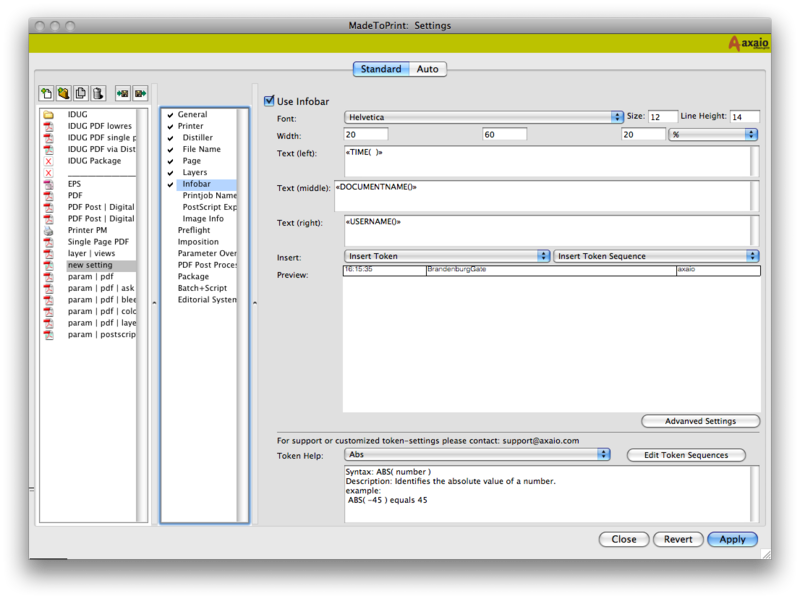 Especially when using the Auto version of MadeToPrint, this feature is very helpful to streamline your workflow. 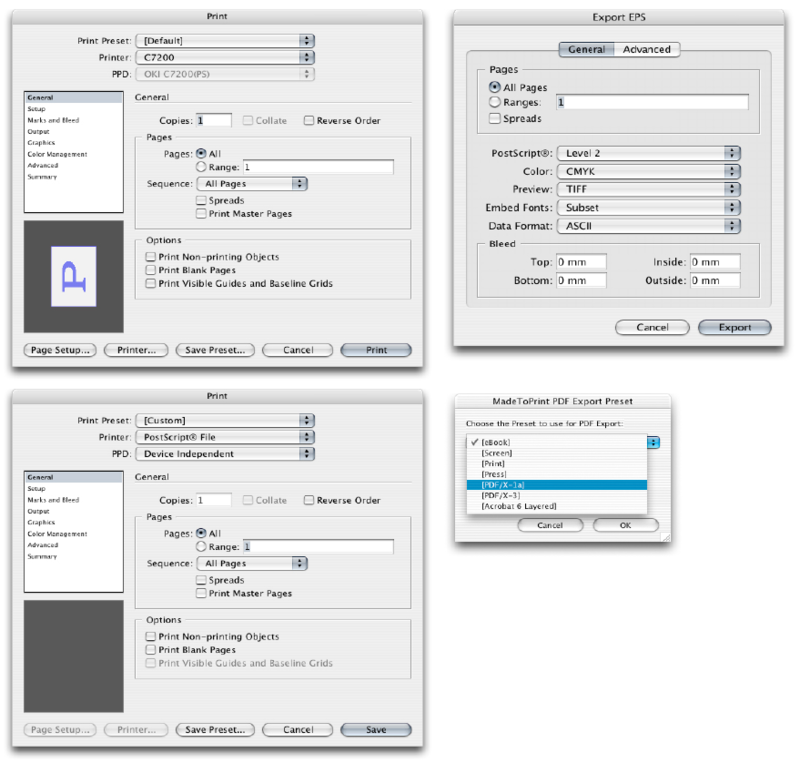 InDesign Preflight – this option lets InDesign check for missing fonts and links when opening the file. Optionally, MadeToPrint can activate project-specific fonts, update modified images, and search for missing images. 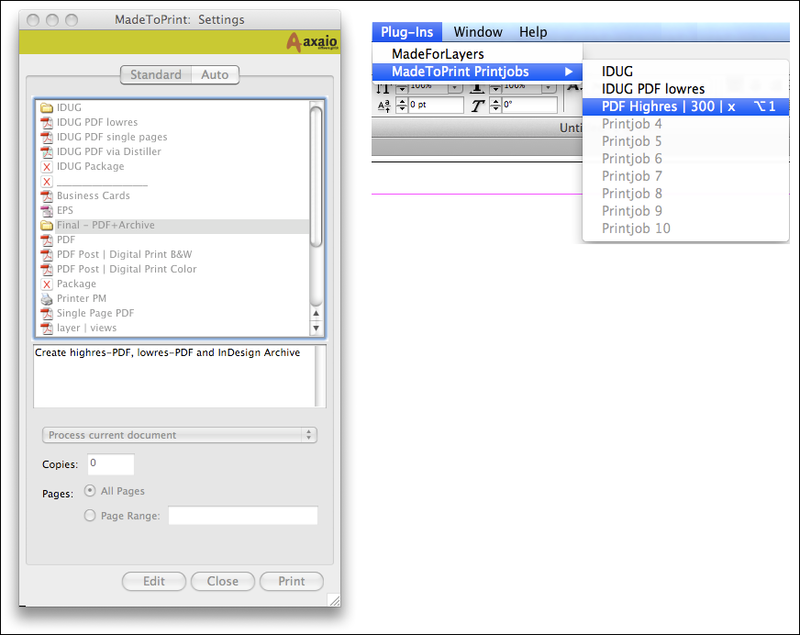 MadeToPrint can also search for fonts and images in the folders that are adjacent to the InDesign document (fig. to the left). Optionally, MadeToPrint can start the search in the parent folder (fig. to the right). In addition you can define to search in a particular folder outside of the package. The automatic activation of fonts and updating of images is particularly important in auto mode and helps to optimize the workflow and avoid manual steps. 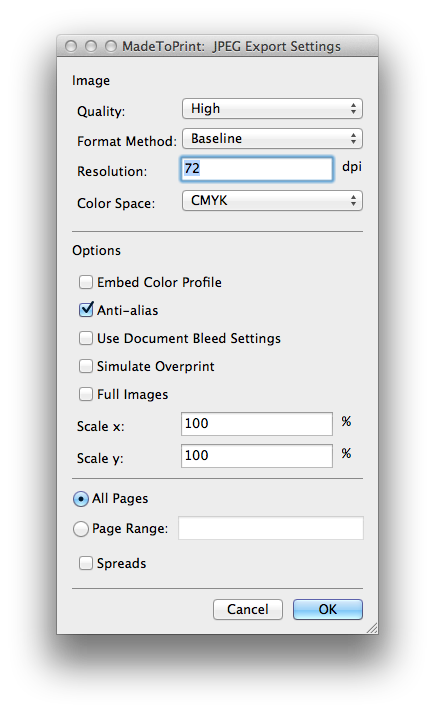 To use InDesign Live Preflight (from CS4), activate the “InDesign Preflight” checkbox. You can access preflight profiles here (profiles defined in the document itself and/or test profiles that you created in InDesign). Action in case of error – using this popup menu, users can define how to proceed in case of preflight errors. 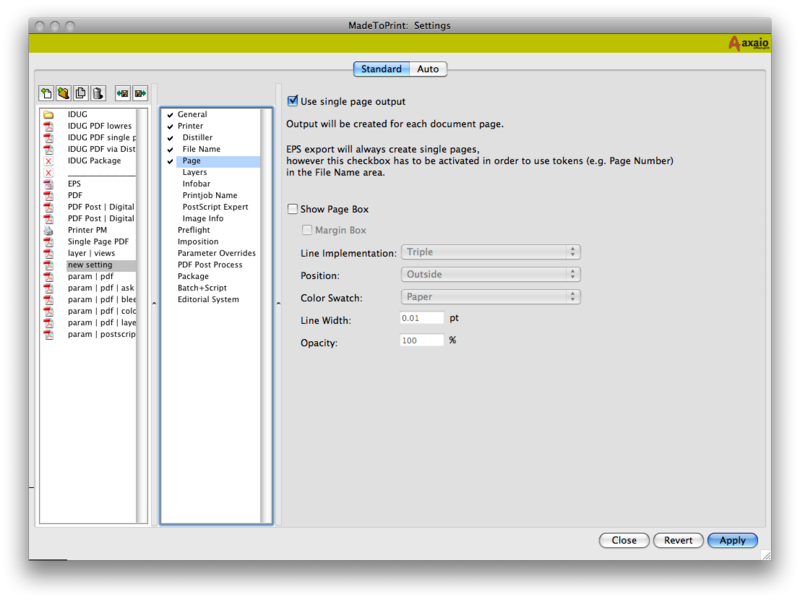 Save report file MadeToPrint can create report files, which will be placed next to the InDesign file. Report files can be created. With the Imposition function, you can print fully imposed PDF files. The preconfigured imposition schemes cover all common imposition tasks. To set up a MadeToPrint job (e.g. for imposition of business cards, double-sided on one page) create a new MadeToPrint job and enter a name under General (here: Business Card). In the Printer area, as target select File (PDF). The Imposition function is not available for PostScript printing. 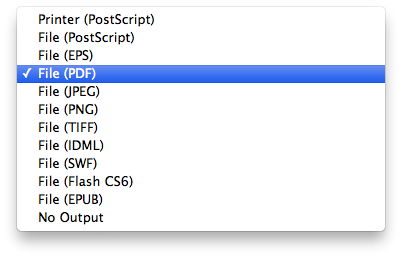 If PostScript exists, you can use the Distiller to create a PDF file. Attention: For smooth operation, ensure that single page printing is deactivated in the Pages area. Then, under Imposition activate the Imposition function and compile the required imposition scheme with the entries under the Runlist and Sheet configuration categories. Here ensure that the number of pages in both categories matches. For the imposition of business cards, the specifications under Runlist: 8 business cards, double-sided and Sheet configuration: A4, 8 business cards are suitable. If the supplied imposition scheme does not cover a task, you can adjust (knowledge of programming required) the settings file in a Script editor. The files are located in the directory Adobe InDesign CS4/Plug-ins/axaio software/pdfToolbox4/var/Actions/Impose. The configuration is now complete. Now save the MadeToPrint job. 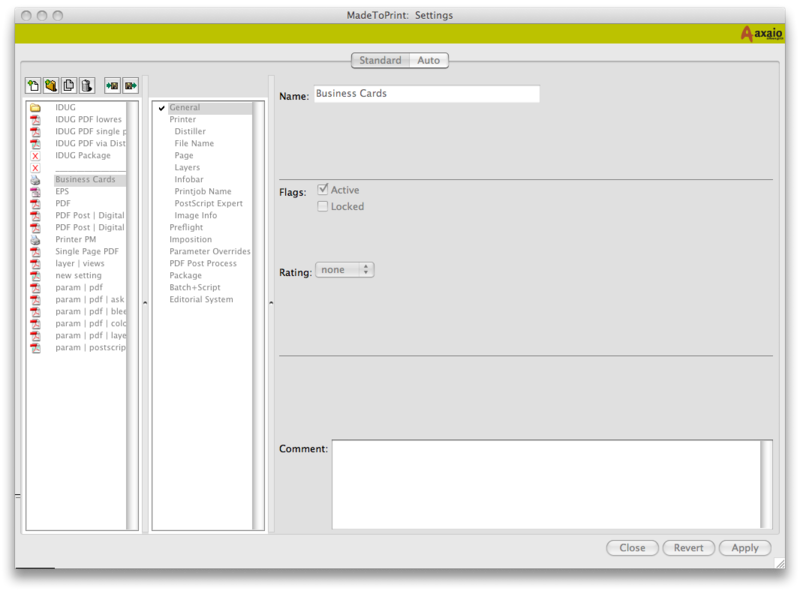 In the MadeToPrint Settings window the Business Card imposition specification is now ready for processing layout documents. It is often necessary to customize individual parameters in an existing job. If you want to change only a single variable and avoid having to create a new job, you can use the “Parameter Overrides” option. 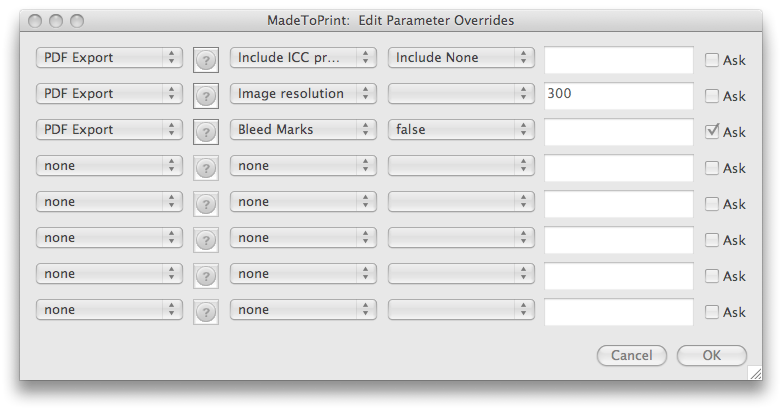 In the “Parameter Overrides” area of the MadeToPrint settings, users can enable the function through the checkbox. The “Edit Parameter Overrides” button takes you to the extensive setting options for customizing parameters. In the “Edit Parameter Overrides” dialog, you can customize individual output options. This includes default values for the Color space, Bleed marks and Image resolution areas. The complete list is displayed here. 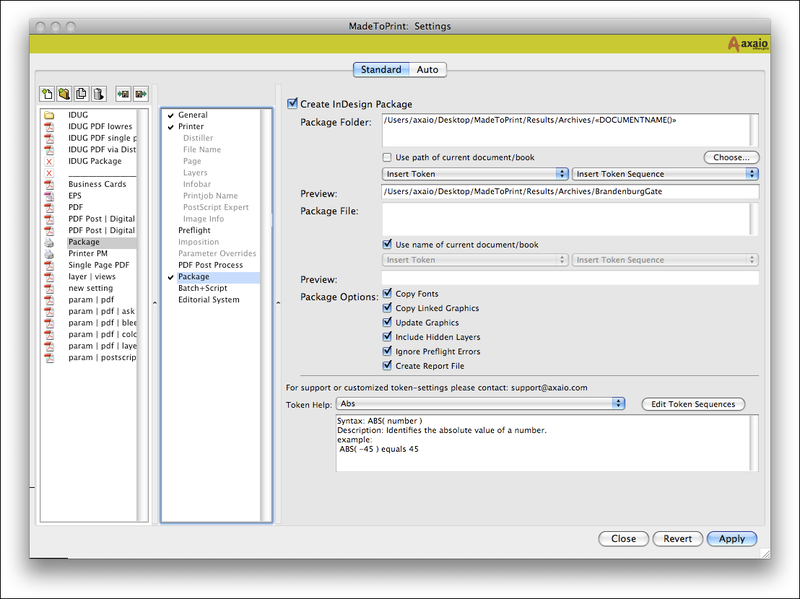 If enabled, the “Ask” checkbox lets you enter individual values at runtime. So you can apply various output parameters for different documents “on-the-fly”. In the job set, the parameters can be configured dynamically as needed: Manually in the MadeToPrint standard version and automatically in the Auto and Server version, by controlling with a job ticket or workflow system. 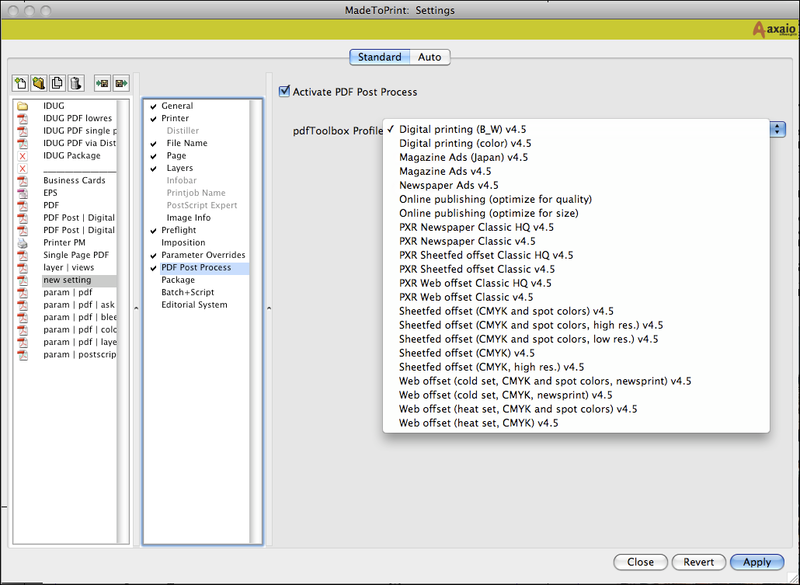 While MadeToPrint checks InDesign files for errors with the Preflight function presented above, with the “PDF Post-Process” option PDF files can be checked in connection with the output for requirements defined before. In the “PDF Post-Process” window, a MadeToPrint Job is released for the subsequent test by clicking “Enable PDF Post-Process”. Some test profiles are already preconfigured, for example for digital printing (black-white and color) and for online publishing of PDF documents. If required, a text report can be created in various formats. You can also specify if you want errors in the PDF to be ignored by MadeToPrint. With the “Manage profiles” button, the user can add more profiles that can be created using the callas pdfToolbox. Another option is to open the PDF generated by MadeToPrint in your default PDF viewer right after the finishing of the export. Enable this checkbox to create packages of InDesign documents. Click the Choose button to select the destination folder. Once again, tokens can be used in order to name packages and package files flexibly and according to individual workflow demands. The option to “Ignore Preflight Errors” is not overwriting the option in the “Preflight”-Panel. It is the counterpart of the warning in the packaging dialog (e.g. when the document contains RGB images). 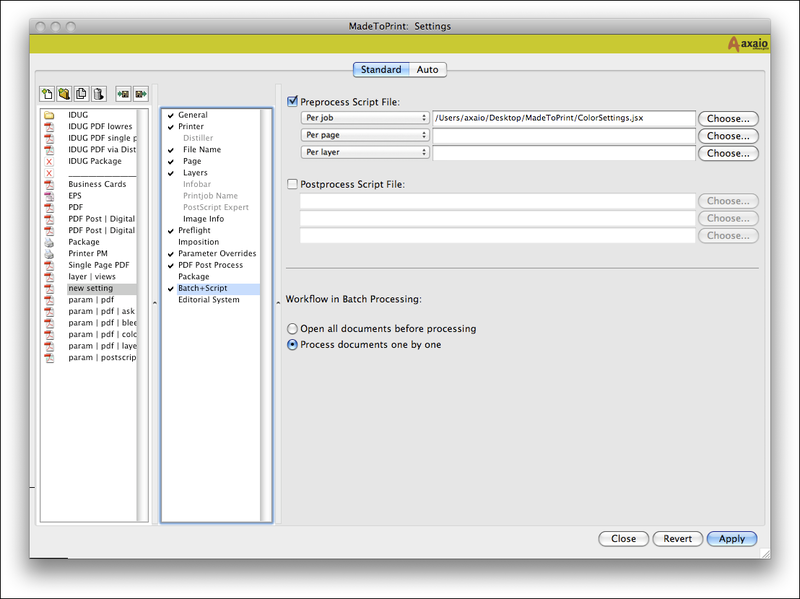 MadeToPrint offers a batch processing functionality, to be used for outputting all InDesign documents located in a specific folder. Each preprocess script can be run once for the job (default), or – in single page/layer output – for each seperate layer or page. If the script returns a string beginning with “error”, MadeToPrint will recognize the error and stop exporting the document. The text behind “error” is defined as error message in Auto mode (see sample). Open all documents before processing. The advantage of this option: The batch process will not be interrupted by upcoming error messages. You can confirm error messages before processing. After a batch processing job has been finished you will find a report file inside the selected batch folder. This report lists processed files as well as files that have not been. In case the preflight option had been activated, error reports will be placed next to the respective InDesign file. Before processing: Updating contents (text and links). After processing: The standard option is No action, it is also possible to select Check in layout or Cancel check out layout. 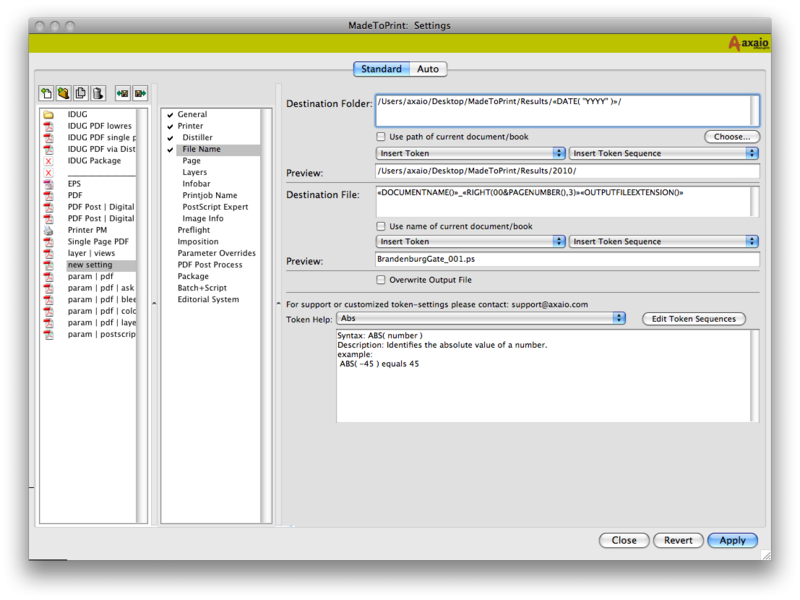 To execute several output jobs together, MadeToPrint offers an option for compiling. You can create a new Set by using the icon shown below. MadeToPrint allows for combining several MadeToPrint jobs into one MadeToPrint Set. 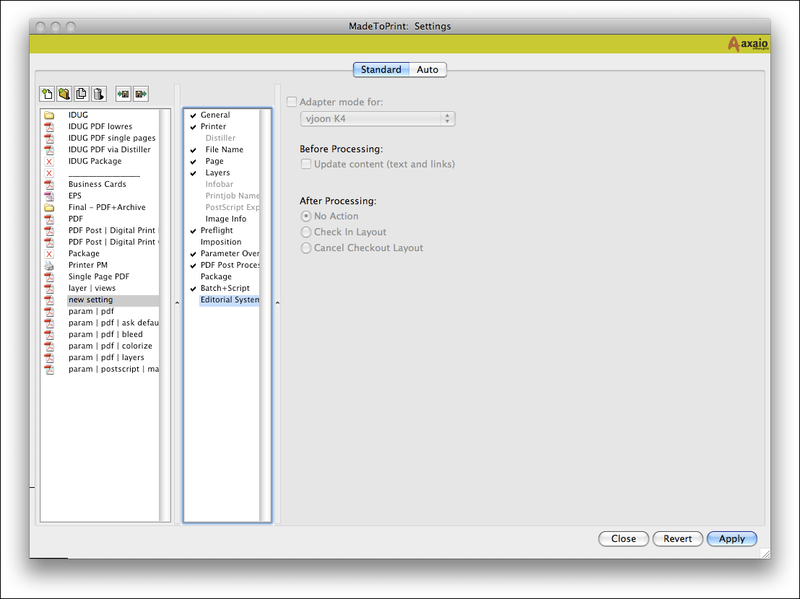 Sets can also be used in batch-processing mode. Similar to MadeToPrint Jobs, sets should be annotated with a name. Also, they can be set to active and locked and be completed with a description. Under Referenced Print Settings a popup menu lists up all available jobs, by using the buttons add and remove jobs can be appended to or deleted from the jobset. Newly created Sets are then listed in Run Mode. The Run Mode lists up all active MadeToPrint Jobs and Sets. If you select a MadeToPrint job or a set in Run Mode, the description will appear as a comment the box below. The first ten printjobs can also be run via Keyboard Shortcuts. The order can be chosen by setting a higher rating. MadeToPrint jobs can be shared with or distributed for other MadeToPrint users. The X stands for the InDesign Version. „InDesign CS6“ is "Adobe InDesign 8". If you use "InDesign CC 2018", the folder is "Adobe InDesign 13"
Running MadeToPrint with the settings saved to the all-user directories will prevent jobs and job sets from being modified this is visualized by a lock behind every job within the run dialog.